Equilibrium represents the state of a process in which the properties like temperature, pressure ,concentration of the system do not show any change with the passage of time. If the opposing processes involve only physical changes, the equilibrium is called physical equilibrium. If the opposing processes involve chemical changes i.e. the opposing processes are chemical reaction, the equilibrium is called chemical equilibrium. At equilibrium ,the two opposing processes take place at equal rate. The mixture of reactants and products at equilibrium is called equilibrium mixture. where A and B are the reactants and X and Y are the products. 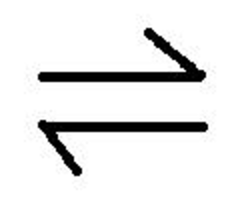 The double arrow between the reactants and products show that the reaction is taking place in both the directions simultaneously. 1)Those reaction which proceed almost to completion i.e. concentration of the reactants left are negligible. 2) Those reactions in which only a small amount of the reactants react and equilibrium is attained i.e. the amount of product formed is very small and the amount of the reactants left at equilibrium are quite large. 3) Those reactions which proceed to such an extent that the concentration of the reactants and products at equilibrium are compatible. The extent to which the reaction proceeds before equilibrium is attained depends upon the experimental conditions . If some ice cubes along with some water at 0°C and normal atmospheric pressure are placed in a thermo flask so that no heat can enter or leave the system, the mass of ice and water is found to remain constant. The temperature at which the solid and liquid form of a pure substance are in equilibrium at the atmospheric pressure is called the normal freezing point on melting point of that substance . Consider a closed vessel connected to a manometer and having arrangement for evacuation and addition of liquid into it.Suppose the vessel is first evacuated. The level of mercury in both the limbs of the manometer will be same. Now suppose water is added into the vessel and the whole apparatus is allowed to stay at room temperature. It is observed that the level of mercury in the left limb of the manometer begins to fall and that in the right limb begins to rise. After sometime, the levels become constant. The system is then said to have attained equilibrium. The difference in the levels of mercury in the two limbs gives the equilibrium vapour pressure of the water at room temperature. In the beginning, more and more of the water is changing into vapours i.e. number of water molecules in the vapour phase increases. Some of these molecules strike back on the surface of the water and are captured into it .The amount of water vapour becomes constant i.e. now as much water changes into vapours the same amount of water vapour change back into the liquid. The liquid with higher vapour pressure is more volatile and has lower boiling point. This type of equilibrium is attained for solids which undergo sublimation.If solid iodine is placed in a closed vessel , violet vapours start appearing in the vessel whose intensity increases with time and ultimately it becomes constant. At this stage ,equilibrium is attained i.e. Suppose more and more of sugar is added into a fixed volume of water at room temperature and stirred thoroughly with a glass rod. The sugar will keep on dissolving but then a stage will come when no more sugar dissolves. Instead it settles down at the bottom. The solution is now said to be saturated and the state of equilibrium. At this stage, as many molecules of sugar from the surface of the undissolved sugar go into the solution, the same number of molecules of sugar from the solution are deposited back on the surface of the undissolved sugar. As a result ,the amount of an dissolved sugar and the concentration of sugar in solution remains constant. The amount of the solid in grams that dissolves in 100 gram of the solvent to form a saturated solution at a particular temperature is called the solubility of that solid in the given solvent at that temperature. This type of equilibrium is found in soda water bottle. where K is a constant of proportionality and is called Henry’s constant. Its value depends upon the nature of the gas ,nature the liquid and temperature. In a sealed soda water bottle ,the pressure of the gas is very high above the liquid ,so the mass of the gas dissolved is also high. As soon as the bottle is opened ,the pressure tends to decrease to atmospheric pressure ,so the solubility decreases, i.e. the dissolved gas escapes out. 1)At equilibrium , some observable property of the system becomes constant. 2)Equilibrium involving gases can be attained only in closed vessel.This is because if the vessel is open, the gas will escape and there will be no equilibrium. 3)Equilibrium is dynamic in nature , i.e. there are two opposing processes taking place at equal rates. 4)At equilibrium, the concentration of the different substances become constant at constant temperature. 5)At equilibrium ,there exist an expression involving the concentration of the substances which is constant at constant temperature. 6)The magnitude of the equilibrium constant represents the extent to which the process proceeds before equilibrium is attained.